Learning economics on Christmas vacation: What’s a bank run? In education we miss out on most information technological innovation. Textbooks were notoriously dull when books were the chief medium found in schools. Schools took 60 years to make progress in showing film. Television, which started out commercially as a great education tool — what was arguably the best orchestra in the U.S. used to play every Sunday on NBC way back when. Then video, then computers, then the internet and personal data devices penetrated modern life, but not yet schools. So I am always pleased to hear after Christmas break the questions high school economics and history students came back to class with, especially after “having to watch” that hoary and venerable old movie, “It’s a Wonderful Life.” Frank Capra’s film cuts through the fog on some important history and economics issues. Not that you find it used much in U.S. schools. What follows is a blog post I did for my U.S. history blog some years back, to answer some of those student questions. George Bailey (played by actor Jimmy Stewart) works to deal with a run on the Bailey Savings & Loan Association in Bedford Falls, New York — a classic “run on the bank” — in the 1946 movie, “It’s a Wonderful Life,” by Frank Capra. Image from Warner Bros., via Our Values blog. Whenever we get to the Great Depression, somebody asks about bank runs. What is a “run on the bank?” Why would people suddenly rush to get their cash out of the bank? And why can’t the bank just pay it out? Banks don’t keep all the money deposited there in the vault. Banks make money by loaning out to others the money put on deposit. The people who get the loans must pay interest on the loan, and that allows the bank to pay interest on the deposits people put there (precious little today — my first account paid 5.25% on my first $5.00 deposit; today you’re lucky to get 1%, and you have to have a sizable minimum, generally. But I digress . . .). So, if you and a hundred other people each deposit $100 in the bank, the bank turns around and loans out as much as they can. Of the $10,000 deposited, say, they loan out $9,000 to the guy who lives next door to you, so he can put an addition on his house. He’ll pay it back, with interest. You can begin to see why a bank run is a problem. If, in one day, every depositor showed up and demanded their deposit, the bank couldn’t pay them all. This is a death sentence in the banking world, for a bank to be unable to meet obligations, and generally that would mean that the bank would be out of business. But of course, that’s rather unfair to the bank — they have their money (your money, really) loaned out to dozens of other people. When those loans come in, the bank will have the cash to pay. A run on the bank puts a kink in those careful, conservative calculations of how much cash a bank needs to have on hand to cover all the transactions of a day. Banks fear a run. That’s what killed banks in 1932 and 1933, in the last year of the Hoover administration. Even a good bank could be doomed by an unjustified run — no bank could repay all of its depositors, in cash, on any one day. 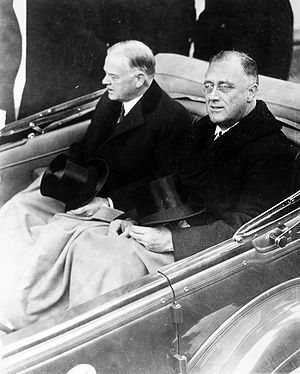 Roosevelt’s bank holiday, just a week after his inauguration, stopped the runs for that week. The Federal Deposit Insurance Corporation (FDIC) insured deposits, so that even were there a run on a bank, a depositor could get his or her money back. Those measures essentially stopped runs on banks for decades. Frank Capra’s 1946 movie, “It’s a Wonderful Life,” tells the story of a man who manages a small town savings and loan association, which is similar to a bank in that it accepts deposits and loans money, but different from a bank in that it is chartered for the benefit of its depositors, or members, and not for a bank corporation. In fact, the antagonist in the film is the town banker, Potter, who does what he can to bring the savings and loan to ruin. This film clip is undoubtedly copyrighted by the current owners of the film’s intellectual property. I wish they would make it available for classroom use without heavy copyright fees, in the interest of the public. It’s another case of a fictional film portraying history better than any history book, and economics, too. Licensing the film for classroom use costs more than teachers can pay — plus, in the dog-eat-teachers world of the War on Education, few administrators stand the use of fiction in history and economics classes. That’s before a teacher even gets to the issue of whether there is technical support to show the film. Have the GOP and the Über-wealthy set up the whole world for another Great Depression? Should we expect a World War to follow? Opportunity to move up, economically, is stifled when so much wealth blocks access to the top economic rungs. These figures come out of a clever analysis by economists Emmanuel Saez of the University of California at Berkeley and Gabriel Zucman of the London School of Economics, who is a visiting professor at Berkeley. The Internal Revenue Service asks about income, not wealth, which is the market value of real estate, stocks, bonds, and other assets. Saez and Zucman were able to deduce wealth by exploiting IRS data going back to when the federal income tax was instituted in 1913. They figured out how much property different strata of society owned by looking at the income that was generated by that property, such as dividends and capital gains. To simplify, if a family reported $1 million in rental income one year and the market rate of return on rental properties was 10 percent, then Saez and Zucman concluded that the family must have owned property worth $10 million. The message for strivers is that if you want to be very, very rich, start out very rich. The threshold for being in the top 0.1 percent of tax filers in 2012 was wealth of about $20 million. To be in the top 0.01 percent—that’s the 1 Percent club’s 1 Percent club—required net worth of $100 million. Of course, even $100 million is a pittance to Bill Gates, whose net worth, according to the Bloomberg Billionaires Index, is nearly 800 times that. It will require great creativity to work our way out of this maldistribution without some sort of catastrophe. 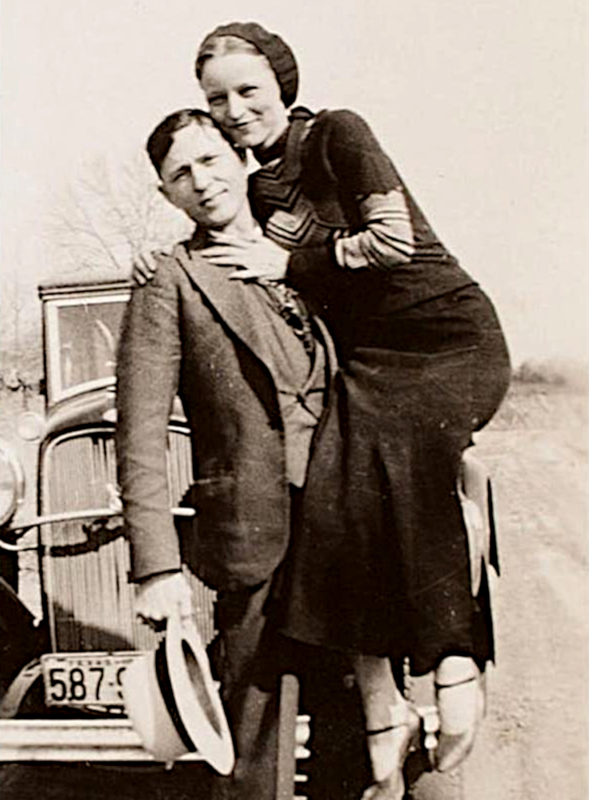 Bonnie Parker and Clyde Barrow, notorious bank-robbing outlaws from Oak Cliff, Texas, ran into a police ambush and were shot to death on May 23, 1934, in Bienville Parish, Louisiana. Though they wished to be buried together, her family protested. 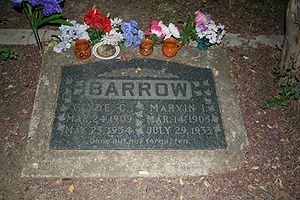 They are buried in separate cemeteries in Dallas. 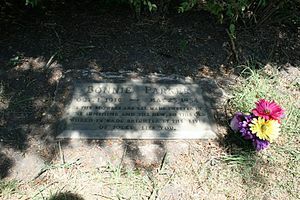 Bonnie is buried in the Crown Hill Cemetery off of Webb Chapel Road in Dallas (do not confuse with the Crown Hill Cemetery in Indianapolis). 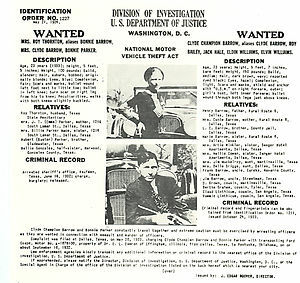 Clyde is buried in the Western Heights Cemetery off of Fort Worth Boulevard, in Oak Cliff (now a part of Dallas). Borrowed originally with express permission from a Wayback Machine; expanded and edited here. What? 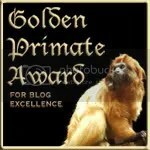 You missed this, on February 20, 2011? Well, here it is again. Please pay attention this time. The U.S. economy appears to be coming apart at the seams. Unemployment remains at nearly ten percent, the highest level in almost 30 years; foreclosures have forced millions of Americans out of their homes; and real incomes have fallen faster and further than at any time since the Great Depression. Many of those laid off fear that the jobs they have lost — the secure, often unionized, industrial jobs that provided wealth, security and opportunity — will never return. They are probably right. And yet a curious thing has happened in the midst of all this misery. The wealthiest Americans, among them presumably the very titans of global finance whose misadventures brought about the financial meltdown, got richer. And not just a little bit richer; a lot richer. In 2009, the average income of the top five percent of earners went up, while on average everyone else’s income went down. This was not an anomaly but rather a continuation of a 40-year trend of ballooning incomes at the very top and stagnant incomes in the middle and at the bottom. The share of total income going to the top one percent has increased from roughly eight percent in the 1960s to more than 20 percent today. This what the political scientists Jacob Hacker and Paul Pierson call the “winner-take-all economy.” It is not a picture of a healthy society. Such a level of economic inequality, not seen in the United States since the eve of the Great Depression, bespeaks a political economy in which the financial rewards are increasingly concentrated among a tiny elite and whose risks are borne by an increasingly exposed and unprotected middle class. Income inequality in the United States is higher than in any other advanced democracy and by conventional measures comparable to that in countries such as Ghana, Nicaragua, and Turkmenistan. 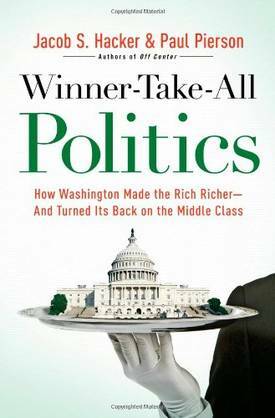 Robert C. Lieberman, reviewing the book Winner-Take-All Politics: How Washington Made the Rich Richer — and Turned Its Back on the Middle Class, by Jacob S. Hacker and Paul Pierson, Simon and Schuster, 2010, 368 pages. $27.00. ; review appears in Foreign Affairs, January/February 2011, pp. 154-158. Democracy in America column in The Economist, September 21, 2010, comments by M.S. on the arguments in the book; in the same journal, earlier, harsh commentary against the book’s thesis, by WW. 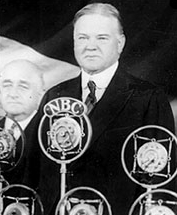 Just a month before he would be crushed at the polls by Franklin Roosevelt, President Herbert Hoover returned to Iowa, his proud home state, to deliver this speech in Des Moines, detailing actions his administration had taken over the previous 18 months to save the U.S. and world economies. Much of this action had been out of the glare of popular press. Hoover hoped that by explaining the difficult battles his administration fought behind the huge oak doors of boardrooms and international diplomacy, Americans might appreciate more what he had accomplished, and not focus so much on the fact that the Great Depression still ravaged millions of Americans. In today’s anti-credit political environment, it is interesting to see one of our most ardent businessman presidents defend credit. In an irony unappreciated in today’s political discussions, much of the discussion in 1932 between Hoover and Roosevelt was over which one could better manage to get to and keep a balanced budget. The full speech is available at The American Presidency Project housed at the University of California – Santa Barbara. Politics wonks, history fans, and economists will want to look at the full speech this line is ripped from, contextually bereft. Context, in this case, does not change the meaning, but deepens the complexity of the issues and time. Hoover bragged about keeping the U.S. on the gold standard, because so many contracts and mortgages were written to be payable in gold, and not currency. So leaving the gold standard could have enormous disrupting influence on credit. The first of these perils was the steady strangulation of credit through the removal of $3 billions of gold and currency by foreign drains and by the hoarding of our own citizens from the channels of our commerce and business. And let me remind you that credit is the lifeblood of business, the lifeblood of prices and of jobs. Now, we have fought an unending war against the effect of these calamities upon our people in America. This is no time to recount the battles on a thousand fronts. We have fought the fight to protect our people in a thousand cities from hunger and cold. We have carried on an unceasing campaign to protect the Nation from those unhealing class bitternesses which arise from strikes and lockouts and industrial conflict. We have accomplished this through the willing agreement of employer and labor which placed humanity before money through the sacrifice of profits and dividends before wages. We have defended millions from the tragic result of droughts. We have mobilized a vast expansion of public construction to make work for the unemployed. We fought the battle to balance the budget. We have defended the country from being forced off the gold standard, with its crushing effect upon all who might be in debt. We have battled to provide a supply of credits to merchants and farmers and industries. We have fought to retard falling prices. We have struggled to save homes and farms from foreclosure of mortgages, battled to save millions of depositors and borrowers from the ruin caused by the failure of banks, fought to assure the safety of millions of policyholders from failure of their insurance companies, and fought to save commerce and employment from the failure of railways. 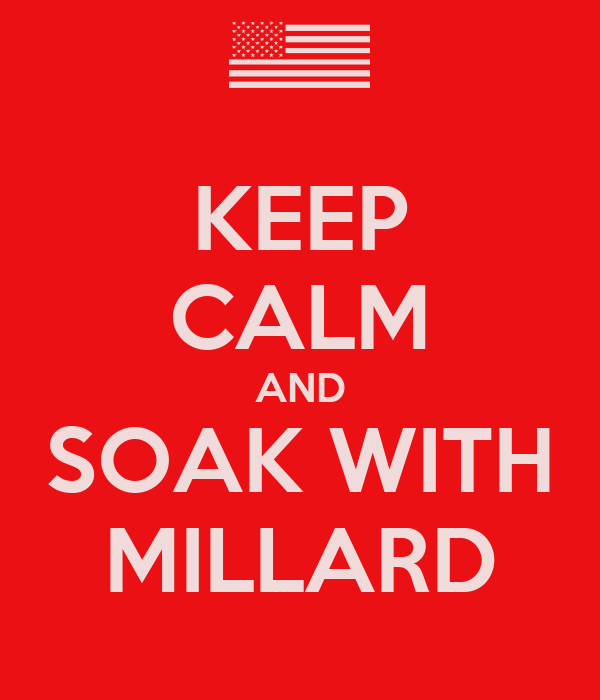 We have fought to secure the disarmament and to maintain the peace of the world. We have fought for stability in other countries whose failure would inevitably injure us. And, above all, we have fought to preserve the safety, the principles, and the ideals of American life. We have builded the foundations of recovery. Now, all these battles, related and unrelated, have had a single strategy and a single purpose. That was to protect your living, your comfort, and the safety of your fireside. They have been waged and have succeeded in protecting you from infinitely greater harm that might have come to you. Thousands of our people in their bitter distress and losses today are saying that “things could not be worse.” No person who has any remote understanding of the forces which confronted this country during these last 18 months ever utters that remark. Had it not been for the immediate and unprecedented actions of our Government things would be infinitely worse today. Instead of moving forward we would be degenerating for years to come, even if we had not gone clear over the precipice, with the total destruction of every ideal we hold dear. Let no man tell you that it could not be worse. It could be so much worse that these days now, distressing as they are, would look like veritable prosperity. In all these great efforts there has been a constant difficulty of translating the daily action into terms of public understanding. The forces in motion have been so gigantic, so complex in character, the instrumentalities and actions that we must undertake to deal with them have been so involved, the figures we must use are so astronomical as to seem to have but little relation to the family in the apartment or the cottage or on the farm. If Hoover made that speech today, every fellow at the Hoover Institution would sign a petition demanding his impeachment, never mind that he’s not president any more. A few notes about the photograph at the top: This photo shows two former presidents, Herbert Hoover and Harry S Truman, walking through a crowd at the dedication of the Hoover Presidential Library and Museum, in West Branch, Iowa, in 1962. One might pay careful attention to how lax security was, generally — the crowd is allowed within an arm’s length of the two former presidents — and this was after an assassination attempt had been made on Truman, in Washington, years before. Insignia on the uniforms of the police are difficult to discern, but from the uniforms it looks as if there was a combination of local police, possibly a county sheriff’s staff, and Iowa state highway patrol troopers. I found it interesting to note that several of the younger men appear to be Explorer Scouts, BSA — one wearing what appears to be an Eagle Scout neckerchief. Cameras were special event tools, but generally not of the quality that could get a decent photograph at an event like this, except for professionals with professional cameras. Still, visible are double-lens reflex cameras held up in hope of a proper aim, small Kodaks, one man winding film in a 35-mm single-lens reflex, and a tiny handful of home movie cameras (with three lenses on the front — wide angle, normal and modest telephoto). Click on the photo for an expanded view, and see what else you may. 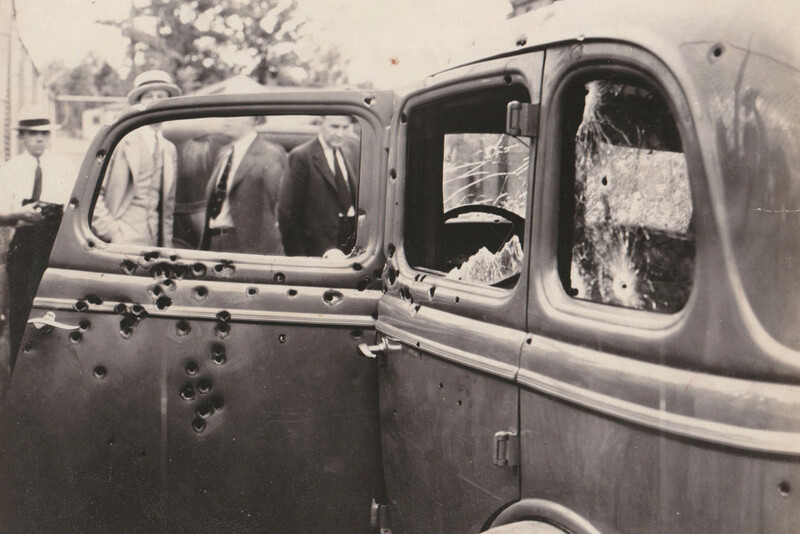 If by chance you know anything about this photo, Dear Reader, please tell, in comments. Tip of the old scrub brush to Henry Mowry at Mowryblog. More that you didn’t know about Hoover: Iowa Public Television link to The American Experience, “The Great Famine,” the story of Herbert Hoover’s attempt to save the people of the Soviet Union from starvation in the 1920s, when he was Secretary of Commerce. I posted a short excerpt from a recent column by economist Paul Krugman, explaining why GOP reliance on magic to fix the economy probably won’t work. Commenter David Xavier took issue with Krugman’s analysis. David’s comment brought home to me just how badly many self-described conservatives misunderstand basic economics, especially the keystone free enterprise principles of supply and demand. My explanation of why supply side economics can’t work came out for the 21st time at least. Let’s make a post of it, in hope that more people may read it and view it, and understanding may increase. Krugman wants the government to spend as this will drive demand. But “demand is constituted by supply”. To buy something you must first produce and sell something. The selling is what gets you the money, but the production of value adding output is what first allows you to sell. Without value adding activity, there is nothing to sell and therefore there is no basis for demand. Well, there’s the problem. You don’t understand either the law of supply, nor the law of demand. You’re talking “supply side” economics, which we discovered didn’t work way back in 1982 through 1988. Supply does not stimulate demand, ceteris paribus. It’s the other way around. Henry Ford’s Model A didn’t created demand for transportation; the demand for transportation, coupled with a demand for transportation that didn’t involve horses and their natural effluents, created a demand for a horseless carriage. Ford created a machine that met that demand, and could manufacture it in enough quantity to matter. Demand is not “constituted from supply.” Demand comes from needs, and wants. If supply can be created to meet that demand, demand can be met from supply. But demand comes first, as Krugman, a Nobel-winning economist, well understands. If consumers have no money to buy, the quantity supplied cannot matter in the least. If there were no demand for transportation at all, Henry Ford is sunk. The law of supply explains how producers go about meeting demands — if prices are higher, they are happier to supply more. Again, if consumers have no money to purchase the good or service offered, the amount of supply is completely irrelevant. Before Henry Ford’s mass production of automobiles created a demand for gasoline, gasoline was cast off from oil refining as a waste product from the production of kerosene for lanterns. Refineries from Standard Oil dumped millions of gallons of gasoline into rivers — no demand, the massive supply simply did not matter. And as we can see from that example, demand not only creates the market, it can make a product considered to be waste, into the economic equivalent of gold. Without demand, supply is simply excess manure, or gasoline by-product from the production of kerosene, to be dumped into a river (and thereby pollute the hell out of the river). You’re right to say that without value-added activity, there is no economic activity. But tell that to Mitt Romney, who thinks finance is the magic, and not production. A key problem with all of Republican economics is the ignoring of consumers, and ignoring the reality that consumers need money to stimulate demand. Tax cuts can’t help the hungry, who cannot eat tax cuts, nor the unemployed, who cannot take to the bank tax cuts on non-existent income. Your odd myopia — maybe blindness — to the reality of how economics works, is shared by a lot of so-called conservatives. It’s a tragedy; it’s a tragedy I hope voters will put an end to, soon. Right now, businesses are sitting on a pool of about $2 trillion, profits they’ve accumulated since 2008. If supply side economics worked, that money would be invested in manufacturing and service creation, and we should have an unemployment rate in negative numbers. The disproof of supply side economics is our current situation. Employers have plenty of supply of money, but they refuse to hire without demonstration of demand from consumers. Unemployed consumers, lacking money, cannot make that demand up from thin air. Magic does not work, in the real world of supply and demand, in economics. Nota bene: Videos come from a delightful series on economics created and put up on YouTube by Dr. Mary J. Glasson, licensed under a Creative Commons Attribution-NonCommercial-NoDerivs 3.0 Unported License. Glasson’s series is available at YouTube and covers almost every topic in an entry-level survey undergraduate economics course. Look for “mjmfoodie” at YouTube.com. You are currently browsing the archives for the Great Depression category.